When I did my sleep study in the hospital, the first mask that they tested me with was the Fisher & Paykel Simplus Mask. The sleep technician said that this new mask was getting great results for most people they’d tested it on and that it was now the first one they tried for anyone who needed a full face mask. Within a couple minutes the technician had me strapped in and we were testing the mask with some pressure from the machine. This was the first time I’d ever worn a CPAP mask and it was very comfortable, I didn’t find it unnerving or distracting at all. Most importantly, there were no leaks and we had a good seal! That night I slept really well in the sleep clinic and despite a few “first time” issues with the mask, we had a pretty good result and the next morning the technician told me she was recommending to doctor that I use the F&P Simplus when I started my CPAP therapy at home. When it came time to go to the CPAP supplier and pick up my trial equipment we tested out the Simplus. Strangely enough in their offices, we couldn’t get a seal, and the Simplus was leaking significantly into my eyes. Fast forward a few weeks and having tried a few other masks, I asked the equipment supplier if we could try the Simplus again. We went through the fitting this time and it worked a treat – I think during the initial fitting in the supplier’s office they tried a medium size mask rather than the large and it may have been too small. The first night I got the Simplus home I put it on, adjusted the straps and fell right to sleep. I woke up the next morning feeling refreshed and no pain or discomfort on my skin from the mask. My AHI and low leakage numbers confirmed that I’d had a good sleep and no issues with the mask. The Simplus was easily the most comfortable mask I’ve worn to date. The mask fits securely without being too tight and causing marks or bruises – bruising and blistering across the bridge of the nose can be a real problem with some masks, but not this one. The headgear on this mask is my favourite set that I’ve tried to date. The straps are easy to adjust even while lying down, so if you find a small leak or something in the middle of the night, you can quickly adjust the velcro straps without having to get out of bed. One minor problem that I have is that I sometimes find the lower straps ride up the side of my neck a bit during the night, but that’s easily fixed and is probably more to do with my face shape than anything else. The clips on the Fisher & Paykel Simplus Full Face Mask make taking it on and off a breeze. It has a very nice “catch” system that is secure when engaged but very easily removed with a quick flick of the wrist. The mask is also incredibly easy to clean and service because the frame and the mask come apart and clip together so easily. You can literally remove the mask from the frame with one hand and snap it back in place just as quickly. The frame has been designed to work with all three sizes of masks: small, medium and large. I clean the mask in the morning with warm water and a little Baby Shampoo. I haven’t tried the CPAP cleaning wipes that you can buy online just yet but will post a review of these when I do. 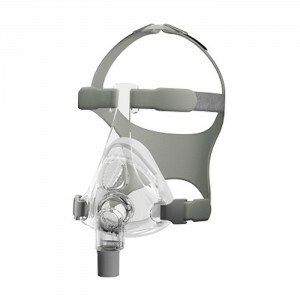 Having tried masks from all of the major suppliers of CPAP masks, I am convinced that the Fisher & Paykel Simplus is by far the easiest to use and most comfortable CPAP full face mask on the market today. Paul Erasmus demonstrated the new Simplus sleep mask last evening at Metrowest Hospital. As far as I understand, the Simplus hasn’t yet been released in the US. It is available in Canada, Australia, Europe and New Zealand at this point. I’ve been told by numerous people that Fisher & Paykel are hoping to get the Simplus in the US market before the end of 2013. I know the above post is over a year old but I just got the F&P Simplus mask and I thought I would share an issue. I have only had it for a few nights but most of those nights I have been awakened by a high-pitch whistling sound emanating from the vent holes in the mask. Weird and very annoying. I quickly realized it has to do with condensation/moisture build-up inside the mask. (I do use a humidifier.) All it takes is a quick wipe of the outside of the ventilation holes to stop the whistling but, of course, by that time “I’m awake.” And last night it repeatedly resumed shortly after I wiped. I finally had to switch back to my Quattro FX which is not conducive to side sleeping. I do clean the mask every morning, so that’s not the issue. Coincidentally, you mentioned a whistling problem in one of your other posts regarding the PR Amara mask. Did you ever have that problem with the Simplus? -Thanks. I am still using my Simplus mask and it has been 18 months. I’ve tried about a half dozen others and the only one that even came close was the Philips FitLife full face mask. The problem with that one was that it got really hot inside the fully enclosed mask. With respect to the whistling, I get it occasionally with the Simplus, but rarely. I have turned my humidifier to zero now that we’re getting into the warmer weather here in Australia. In the winter, I turned it up to 1 because there was condensation forming. If you just wipe your hand quickly over the vents just above the bridge of your nose, it goes away. One thing I have noticed, is that if I wash my mask out later in the afternoon and it doesn’t FULLY dry, I get the whistling problem a bit until it dries out. Gents – I have had the Simplus for a week or so now. I find my old proven method of rinsing the BEST mask I have had in nearly 20 years in some warm water and vinegar the best way to clean it. However, I am a little hesitant on how to clean the ‘head gear’ in order to get the longest life out of it. Any suggestions. I literally just washed my headgear today. I’ve not had a real problem, I just pop off the buckles and hand wash it with baby soap and warm water. I give it a bit of a wringing out with my hands and then pop it on the clothes line to air dry. Within an hour it’s all good. I can tell you from personal experience – my headgear is now about a year old and it still works fine, but it is stretching a little. I would imagine that I’ll have to replace it in the next three or four months. I’ve had an F&P Premo with Simplus mask since 2014, and have experienced the whistling when the mask is damp. I’m curious about users keeping the humidifier setting on 0-1: the technician who showed me my unit on purchase (at the hospital I had my sleep study done at) recommended 4, but I use 2 or 3. Otherwise I empty the rather small water reservoir too quickly, but too low and I wake up with a dry throat. I live in the cool climate of Tasmania but bought the machine when I lived in the subtropics, where warm nights were alleviated by (drying) aircon. My main issues with the F&P are disgracefully expensive parts. I am about to buy my third set of headgear (after many running repairs to the previous two) and now need a new mask facepiece after scratching my nose in my sleep and tearing the silicone seal. The odd-shaped filters are also a nuisance, given their ridiculous price and six weekly changeover recommendation. I wash mine but will be buying some with the mask parts.